No Hindi? No problem! Pictures bridging language “disability”. Today I had breakfast with Mrs. Mukerji. Anu has gone to Delhi for a few days but will be back soon. Shibani and Pradeep were visiting a possible venue for the Museum School’s annual function (all the children have the chance to perform on stage), so I was my own company in the morning. It was just what I needed to launch into writing drafts of each of my tasks. At then end of a few hours I had a rambly first version of a guide to thinking the unthinkable, a partial flow chart map of the McMaster Social Innovation Lab’s pipelines for students, faculty and community involvement, and a jumble of words on a page for the Museum School inclusivity project. Think about it, as someone who doesn’t speak Hindi and has limited understanding of it, I could be considered ‘disabled’. But, and this is where I saw for myself what Pradeep had been telling me, this didn’t mean that I couldn’t be included in all that was happening. I just needed to find a workaround, a different way of learning and communicating. Thanks to my sketchpad and markers, I had found one. The language of images and gestures worked for me. Think about it, as someone who doesn’t speak Hindi and has limited understanding of it, I could be considered ‘disabled’. What I found to be especially exciting was that the students had already started communicating to me using this language. 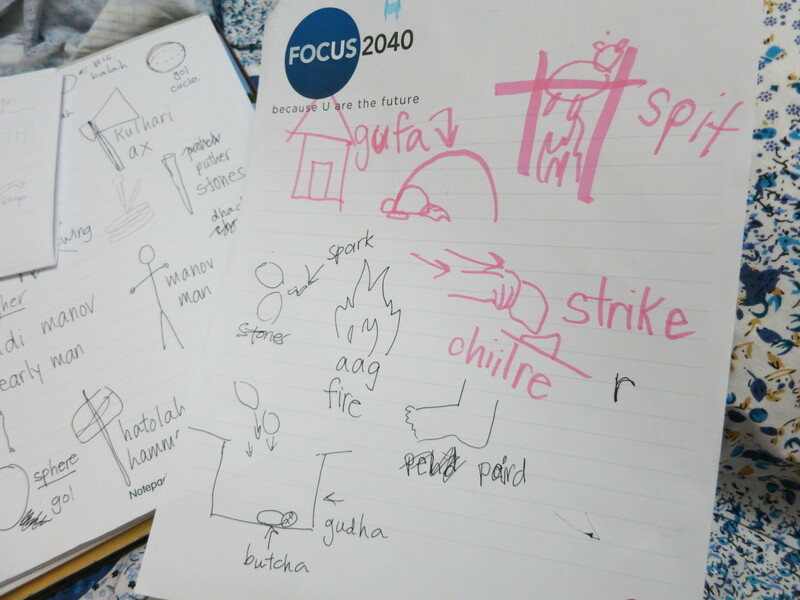 When they were trying to explain “swing” to me, after a few failed attempts, they motioned for my sketchpad and drew it. This picture, coupled with some frantic gestures, led to a “BAM” of understanding. I had already witnessed the solution (or a least part of it) to the problem I was targeting. I started sketching out a way that the school could work to build on the strengths I had already seen. I’ll keep you posted. Today, at the museum of mankind, I was paired up with four of the ‘slowest learners’. I taught them and they taught me entire sentences in Hindi. I was trying to figure out if they also had a way that they liked to learn. I saw that one girl, like me, was always writing. Another explained things to me best by using gestures. The two others seemed to like speaking or being spoken to. My next job is to figure out how to best respond to these different learning styles. Back at the apartment, I Skyped home and learned more about the flooding in Toronto. Ironic, isn’t it? That there would be so much rain at home during the rainy season in Bhopal, yet in Bhopal it has been barely drizzling? I don’t want to be making light of the devastation, but this strange twist of events makes clear to me how wide the space of possibility is. More things can happen than we’ll ever really be able to imagine. Why limit our own expectations of ourselves? 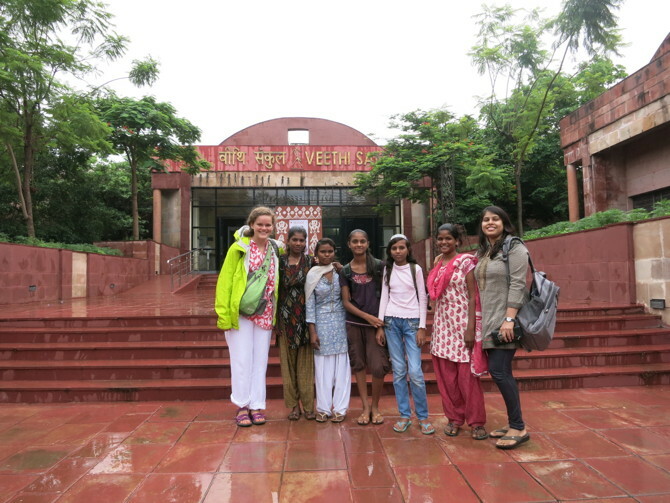 Brianna Smrke, who has been working with the SiG@Waterloo simulation team, is visiting the OaSiS Social Innovations Laboratory in Bhopal, India. She is blogging about her experiences at downwithvowels, which you can also follow here at socialinnovationsimulation.com.